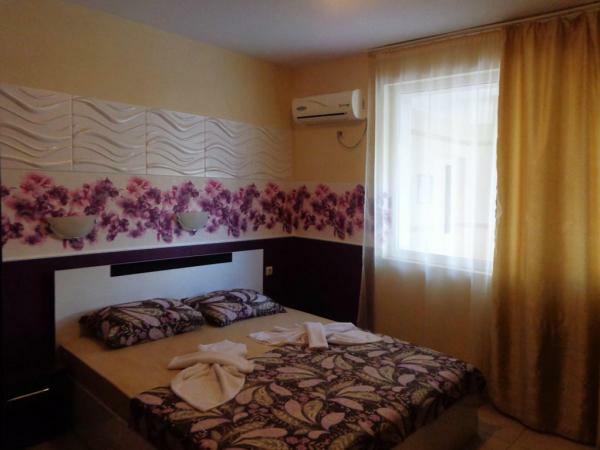 We present to your attention an apartment with 2 bedrooms and convenient layout, located on the 1st floor in apart-complex in Sunny beach resort. The total area of ? ?the apartment is 63 sq.m. The apartment has been recently renovated and is offered for sale with brand new furniture. Its layout is very convenient - the rooms are not transitional: the living room and bedrooms are oriented to the north - overlooking the pool, which provides coolness in the summer and natural climatic comfort. The apartment has one bathroom with a shower. The complex is situated in a quiet area and at the same time there are all necessary services and facilities nearby. The resort center is 1 km away. On the territory of the complex there is a small swimming pool. The complex has a small restaurant-cafe, pool bar, elevator, parking, 24-hour security and maintenance, private access, green areas. It is suitable for year-round living.